I grew up in Media, PA, a suburb outside Philadelphia. I went to college at Carnegie Mellon in Pittsburg, worked in Chicago, and now live in Minnesota. Over the past couple decades it seems I am slowly migrating west. What does design—the noun and verb—mean to you? I think of design as the dynamic act of creating something new that has value to the people it was designed for. and when did it become more visible as a discipline? 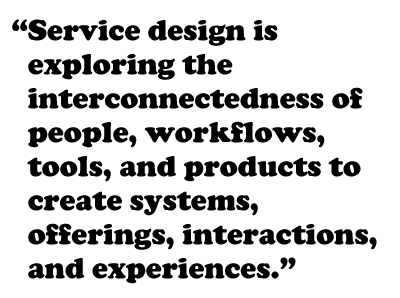 From my perspective, service design is exploring the interconnectedness of people, workflows, tools, and products to create systems, offerings, interactions, and experiences. I believe this discipline has been around for some time; however, I am new to the field and perhaps not the best historian. I came to service design from product development. A few years back, I was excited by the transformational shift I was seeing in design that moved past product and wanted to connect this more strongly to my work. 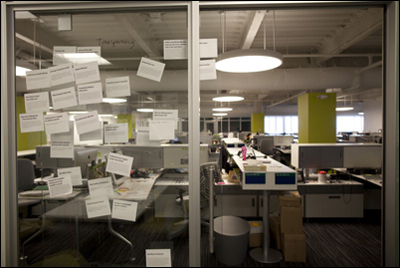 When did you start your focus on service design? How did you turn this focus into your current career path? As mentioned above, a couple years ago, I purposefully looked for opportunities to move away from product development and work more broadly in health care, specifically in hospitals and clinics, as I was fascinated by their complexity and how significantly they were in need of change. 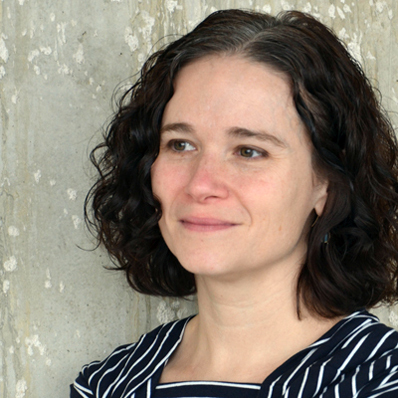 At the time, I was not looking to become a service designer; I just desperately wanted someone to let me dive into the health care system and affect change. I was fortunate to get hired by Mayo Clinic in their Center for Innovation (CFI) to do just that, and it was at this time, I started to appreciate my new role. Are there service designers/design groups you look up to? Who? There are many leading design consultancies and service design groups who seem doing interesting work, especially in the UK and Europe, though the US is catching up quickly. It is interesting to see designers working on complex systems and services within so many industries such as finance, telecom, government public services, and so on. From a distance I admire the work of Livework, Engine Service Design, Design Continuum, Mad*Pow, and Adaptive Path, among others. I hope to continue to follow their work more closely in the future. as it pertains to health care? Health care today, as alluded to in a previous question, is a complex, broken system with no one—patients, providers, hospitals, payers—happy with the current system. Since I began in the CFI, my work has primarily been a project that, at its core, is focused on aligning the costs of care with the financial realities of the near future. From another perspective, this could simply be a cost-cutting exercise where we engage in value-stream mapping, identify waste, and make the system more efficient; however, this approach does not represent service design. When we began this work, we took a different approach. We did significant research within the Clinic to understand key challenges as well as what works well in our system, essentially what we value and want to keep. From the research, we identified different patient types and did in-depth home visits to understand their past, present, and future health care needs, and how the current system supports or does not support their behaviors, goals, motivations, and emotional needs. This work is still ongoing, but one of the key learnings from our efforts is that the current system has standardized in ways that variance and patient complexity are not fully captured at the beginning of the process; therefore, as patients and providers move through the system, disconnects and frustrations snowball, leaving many feeling that the service provided was not optimal. If we look at the system differently, based on our key insights, we could redesign the service of providing health care to include more time and effort upfront to “know the patient” and understand their needs from a medical, psycho-social perspective, as well as the different attitudes and beliefs they will bring to the experience. These moments of previous perceived waste become the foundation for both an efficient system, but, of equal importance, one that is more aligned with the needs of the patient and has provided greater opportunities for initial patient engagement that we hope will continue and grow stronger throughout the journey. To me, if we are able to implement some of this work, this represents an elegant solution that represents good service design as there is no compromise, both patients and our institution benefit from the service design perspective and process being applied to Mayo Clinic. What sources do you recommend to learn about service design? The Service Design Network is a great organization. This group offers a great starting point for a beginner hoping to learn more about what service design is, but also provide a great journal and conference that appeal to designers of any level. When I began my career, I had the title “user researcher,” which, at the time, was a relatively new discipline in design consultancies. During my time in product development, we did generative research to understand users before designing a product or service, and then evaluative research to understand how to iterate on a design. 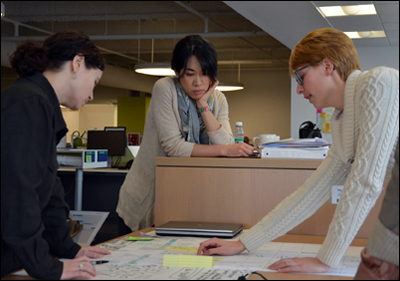 In this process, we typically had separate teams, a research and design team that would hand-off findings and ideas to one another. At CFI, this distinction does not exist, we do what I would describe as design research, in that it is a continual, seamless process that weaves throughout the work. Very few days go by where I am not working with people who will interact or use a service and actively trying to bring their voice and thoughts into the process of design. of your process/workflow and why? As mentioned above, I see design research is a constant; it goes through the whole process starting with framing a problem, all the way through implementation. What methods do you use to help analyze user research? The methods I use are somewhat laborious, I believe in typing up notes from observations and compiling raw data while it is fresh. I do this to archive what we have seen, but I also find the process of compiling to be a moment when I start to understand major themes that are emerging. In addition to themes, I am a big fan of journey mapping—when I first started in research and design this was more of a way to capture workflows but journey maps can be richer—they describe process but also add additional perspectives such as interactions, connections, emotions, tools, etc. I find these very valuable in seeing a bigger picture, and aligning teams around how we are going to innovate moving forward. and not have it get stale? As part of our process, we engage in an activity that we call experimentation, where we are trying to understand an idea in context with the full system to understand benefits, as well as unintended consequences of the idea. We go through different stages of experimentation; some beginning work can be done in a lo-fi paper prototype method or even done through simulation. These experiments we quickly iterate, because we are trying to weed out ideas that are not appropriate quickly. As we continue to hone an idea, we may move into a working prototype to test proof-of-concept. Following these iterations, we will get more and more resolution on experimentation until we have a design that could be diffused into the practice. With this process, it is hard for the user research to get stale, as it is the starting point for continued experimentation and future learning. Writer Alissa Walker wrote an article called “Women in Industrial Design: Where My Ladies At?” Where are the Ladies in Design/Development/Building/Strategy at? Throughout my career, I have seen many talented female designers, who have to push themselves harder to be recognized in comparison to their male counterparts. I believe this will change as a new generation of women designers, who aren’t aware it is a male-dominated culture, become leaders in their organizations and start their own companies. I agree with the author, it is up to us to write our own future and to make it okay to be a woman in design. I have recently been very interested in the perspective Sheryl Sandberg, the COO of Facebook, has in how women can be successful in the workplace and balance a career and family. I am far from qualified to criticize the work of others and there are so many ways individuals may define good and bad design based on what they value. I will say that I value design that strives to embrace complexity by not hiding it from people, but by making complexity transparent yet approachable. The work at the Center for Innovation ranges from small projects to truly transformational shifts in health care that span multiple years. While multi-year projects may seem slow, Mayo Clinic is a large organization within a larger complex health care system. Change in this industry happens slowly, and understanding any potential solution within such a complex system takes time. Honestly, everyday feels like we are a year or more behind where we should be, and we need to work harder. As designers, we are trained to understand critique and to continuously question ideas; however, there can be disagreements working outside the CFI as it is hard to keep a group of people, with different backgrounds, expectations and training, to align around a new service or system change over a period of time. One way we have learned to mitigate disagreements before they happen is to set a strong foundation of understanding of why we are doing the work, what our goals are, and how we will do it. While this may seem obvious, it is something that we try not to forget, and make sure it is visible and understandable throughout the process. Many people can be threatened by the idea that your work will change their job, even if you engage in co-creating solutions. Over my career, I have known this, but honestly did not fully understand why some people resist change until I had a conversation with my mother a couple years ago. She is trained as a RN, worked as a surgical nurse for over 25 years and was dismayed by the introduction of the EMR (Electronic Medial Records) into her hospital. While I and her managers told her all the benefits it would provide, all she could see was that a job in which she was recognized as an expert was now going to require her to relearn, or learn for the first time, skills that she was uncomfortable with. From this conversation, I now have more empathy that for people. Change is hard, sometimes very hard. What I try to do now when working with groups that are apprehensive is to start small; there is no need to solve all problems at one time. Adoption of new ideas can start slowly, and you need to give people the time and space to embrace change. My favorite tools are a pen, a piece of paper, and a group of engaged people. In my work, I am constantly working and interacting with clinicians, care teams, administrators, other designers, and having group conversations that sometimes flow seamlessly or sometimes erratically from idea to idea. I have found that if we draw, write, sketch during the conversations, there is significant value to capturing ideas real time, often to share and focus conversation. Being a designer embedded into Mayo Clinic has many advantages, and one is that I work in the building where patients are seen by their providers for a wide range of conditions, everything from a routine check-up of a person with diabetes to a person with cancer or someone who has just had a life-saving transplant. This environment is inspiring as you see the impact of what you’re doing and why you’re doing it throughout the day. 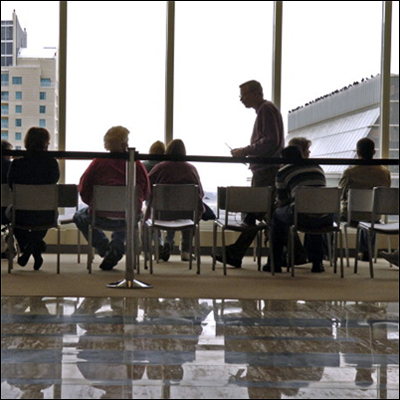 In a course of our work, we have formalized moments were we sit-in on patient appointments or do “patient tracers,” an activity where we will follow a patient throughout their journey; however, anytime I want, especially if I am not feeling inspired or creative, I can go to sit in a waiting room, or the cafeteria, or the pharmacy and just immerse myself. This always provides a new perspective, and I go back to work refreshed and reminded that what we are trying to do will greatly impact so many people. Go for it. There are so many different opportunities to utilize creativity that don’t immediately come to mind. When I went to school, I was a mediocre industrial designer (at best), but stuck with it and realized creativity is not a skill, such as form development or rendering, rather it is a way of thinking or a way of approaching a problem. to be a service designer? Check out many of the good schools who have developed a service design program into their curriculum, and then during summers, intern at different places. There are so many different kinds of service design work in different industries, and interning will provide a lens into what type of work is meaningful to the individual. Mayo Clinic is in Rochester, Minnesota, which is approximately 80 miles from Minneapolis/St. Paul, and has a small, but dedicated and growing arts community, along with some great restaurants. 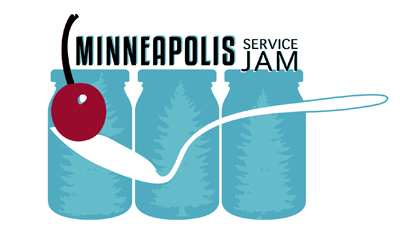 For service design, Minneapolis is (for the first time I believe) a regional host for the Global Service Jam, an event where design professionals from all over the globe meet in over 100 host cities and, in less than 48 hours, develop a prototype of a new service. This year, one of my colleagues has been involved in the organization of the event, and many in my group are attending and playing different roles. All images courtesy of Meredith DeZutter. Typeface of quotations is Cooper Black (1922) designed by Oswald Bruce Cooper in Chicago.